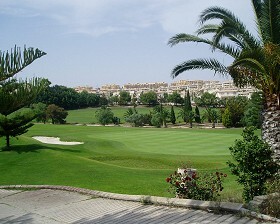 Located 10 km from Torrevieja, the Royal Campoamor Golf Club opened in 1989 and was designed by Carmelo Gracias Caselles. It is 6203 metres long with a par of 72. There are three 18 hole courses within 500 metres distance of Real Club de Golf Campoamor. The Real Club de Colf Campoamor is covered in lush grass, and is surrounded by beautiful pine woods and orange trees and overlooking the coast from Torrevieja to La Manga del Mar Menor. The club house sits on the highest point of the estate and is without doubt the best in the area with great views out over the Mar Menor. 2 hotels are now on site one of which is solely for visiting sports teams. Tough course of the white tees, however, very playable for all golfers off the tees of the day – this course is very popular with Scandinavian and German visitors and booking is essential. Is in better condition than in recent years.